A clear, cool morning that a left a heavy dew on Andiamo started off this day of re-setting for the next part of this adventure. 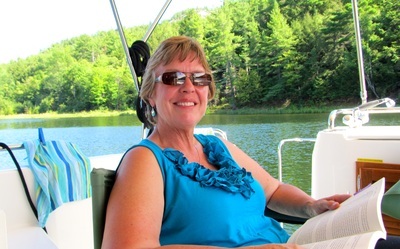 After breakfast, Laurie cleaned the interior and I removed the water spots from the hull and cabin using a water/vinegar solution in a spray bottle. The wax remained and the shine came back. 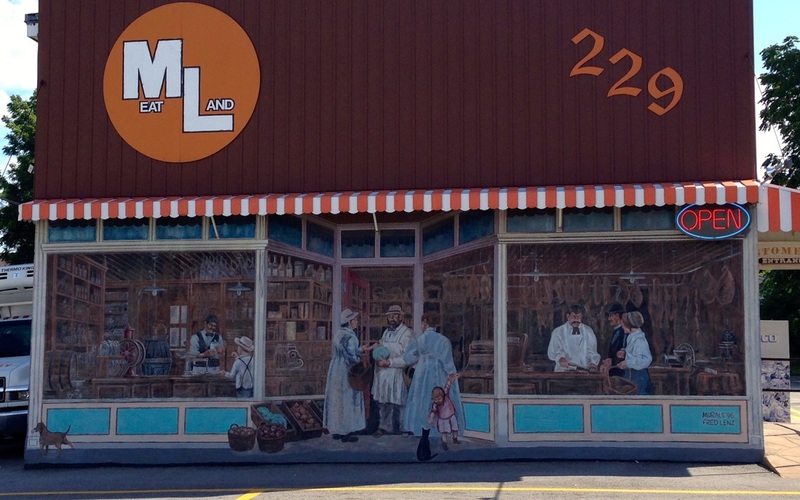 We walked to Midland to see the murals, read the history, buy beer and spirits in two different stores and had a snack at a Tim Horton’s. A call to the marina brought one of the employees to pick us up, a wonderful service that we had not experienced before and is added to the emerging list of what an ideal marina looks like. Having easy and unlimited Wi-Fi was wonderful after being without it while being on the locks on the Trent-Severn. The limitations of connectivity would start again tomorrow and would likely continue for the next 4 weeks or until Andiamo crossed backed into Verizon-land. Today’s serendipity came in parts. 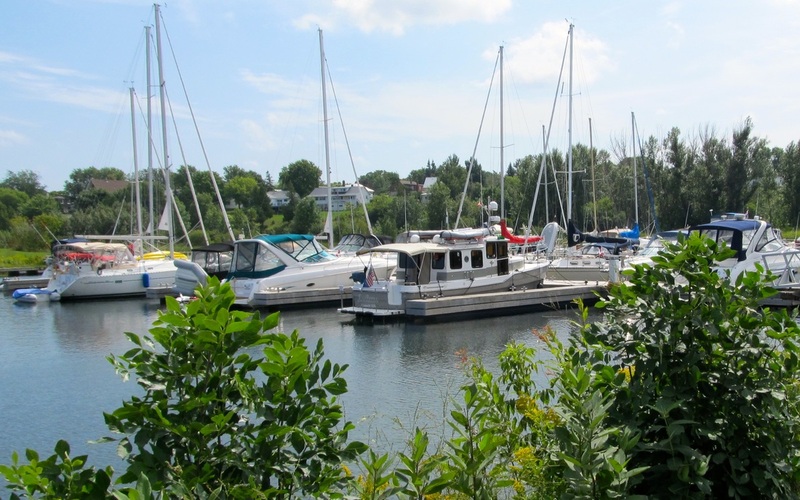 The first part was that Brian, the marina manager, had found a person to take Peggy to the Toronto airport at a considerable savings. The ride arrived at noon and Peggy was whisked off for her long journey back to her universe in the greater Los Angeles area. After she left, we re-set the tug for Georgian Bay and finished the cleaning. 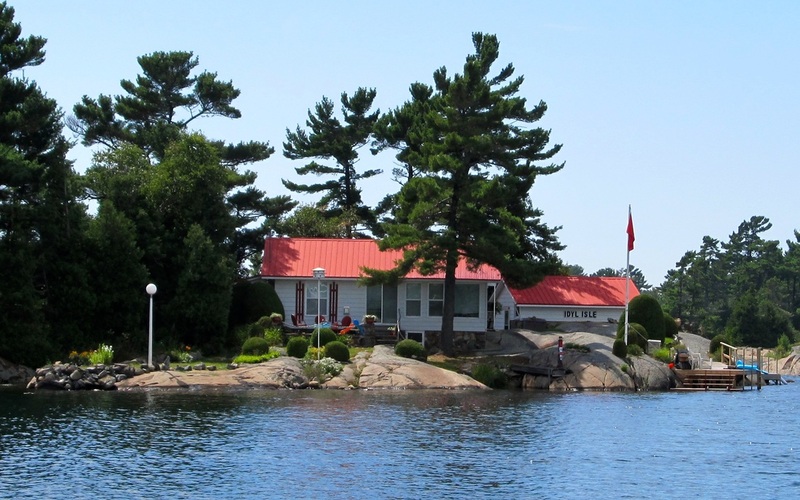 The second part of serendipity came from a neighboring boating couple, Bill and Marsha, and a chance conversation about boating in Georgian Bay. They had sailed the area for years, kept their boat in the marina during the season and then stored it back home near Niagara Falls. They came over, marked up our charts and provided wisdom. 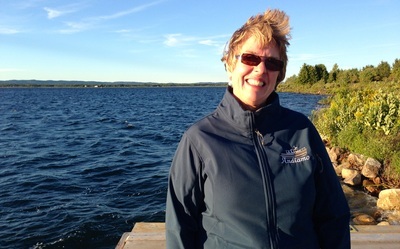 Laurie worked on assimilating the information and options for the coming days to become more comfortable about choosing options of destinations for the Georgian Bay and North Channel. The next day, the weather predictions were off again and the wind and rain for the morning did not happen. We took advantage of the change and switched to travel mode. After a short delay at the pump-out dock, Andiamo headed out of Midland and towards Beausoleil Island that is part of the Georgian Bay Islands National Park. The wind created a very manageable one foot chop that flattened out after getting behind Present Island. We found the small craft route (sometimes referred to as the small boat channel), which is marked on the charts but is not on the channel markers, and this would be the tug’s main route to explore the islands in Georgian Bay. 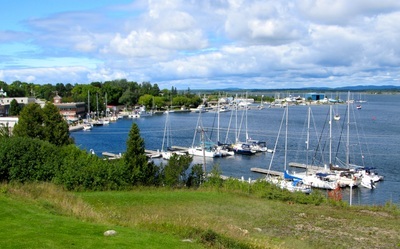 The big boats often use only parts of the small craft route to get to marinas or anchorages, and travel the expanse of the bay by staying in the main body of the lake. 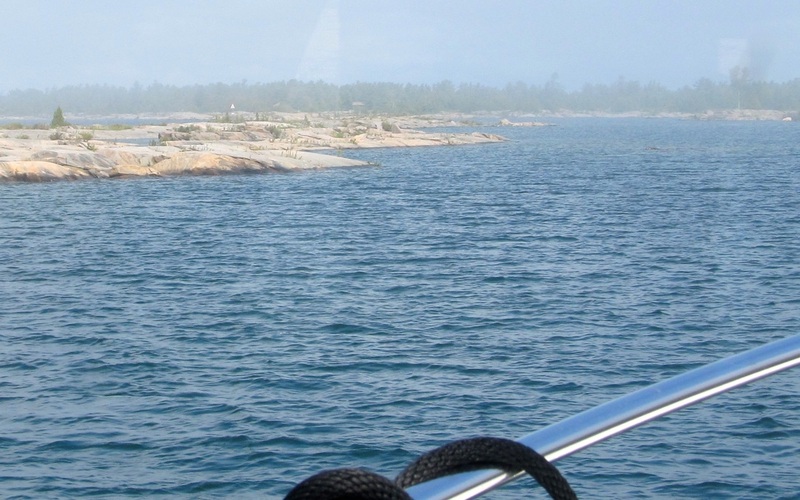 This route between the thousands of islands, can be very narrow, and is fun to steer through. The depths ranged from 7 to 95 feet. The small craft route is slower and longer and there are speed limits in the congested areas. 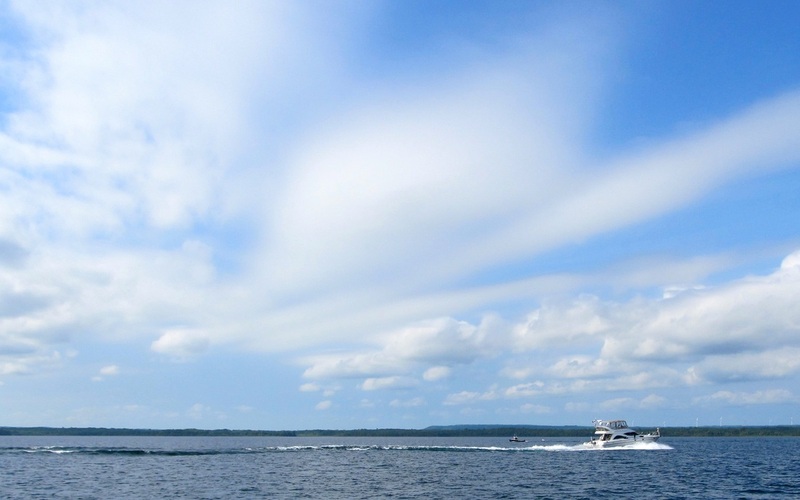 Also, the route can be very busy with powerboats that have little regard for speed and they will cause wakes. 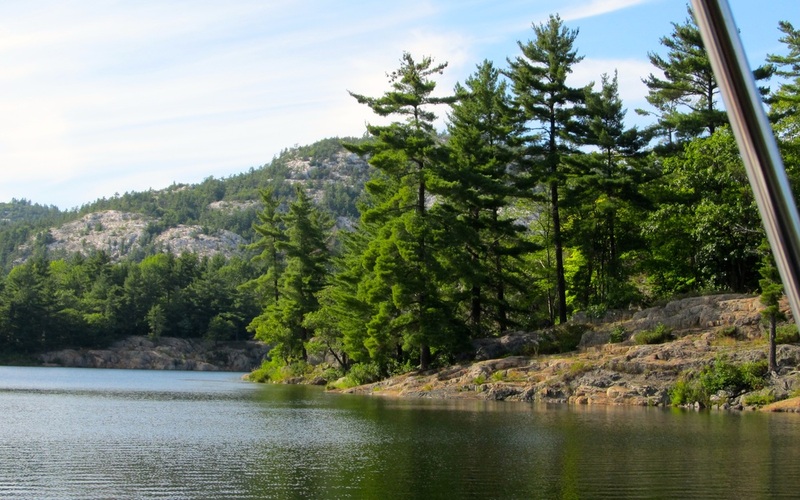 The islands are very low in elevation, no more than 30 feet above the lake, dominated by rock with a thin layer of soil that the pines, oaks, cedars and deciduous trees can survive on. 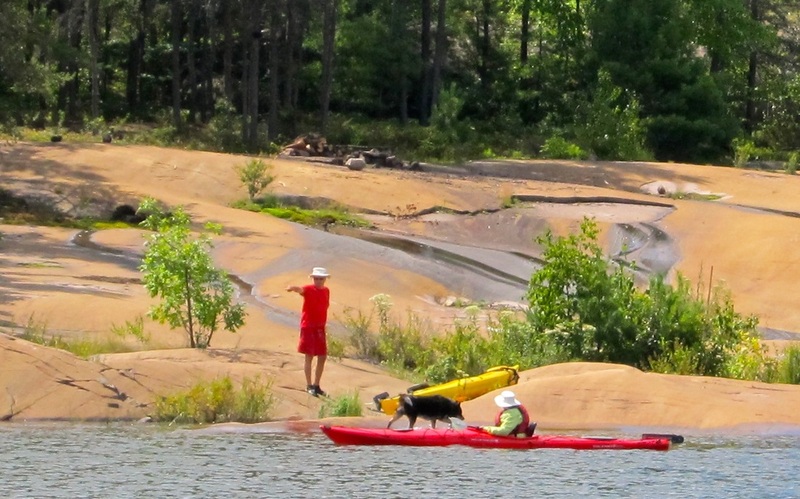 The islands provide little wind protection but can stop the fetch-created waves. 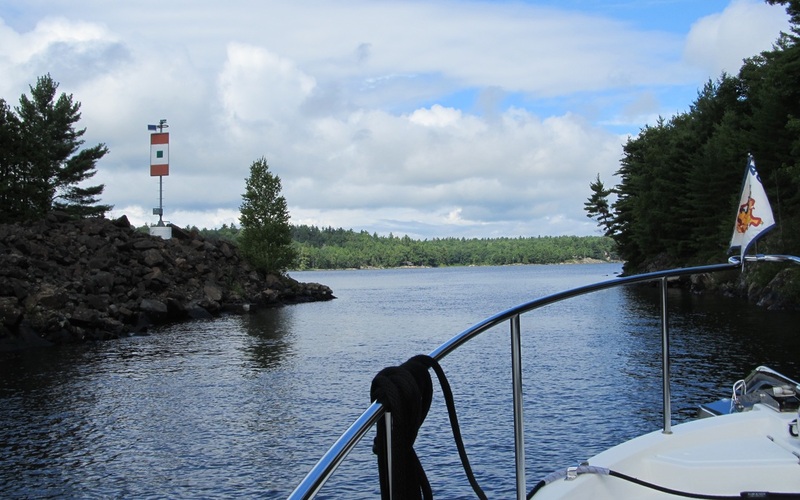 After joining the small craft route, Andiamo was in the inner channel with a low speed limit, lots of channel markers marking the shoals, boats, marinas, cottages and even a store. We did a look-see at Frying Pan Bay at the park and there was room at noon to anchor. 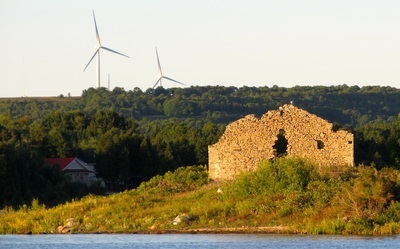 Not feeling the need to stop, Andiamo continued northward, past Penetang Rock that marks the route inland on Musquash Channel where timber mills flourished 100 years ago. Realizing that Andiamo was not receiving all the Canadian VHF radio channels, especially the weather channels and the just-released weather predictions, a quick read of the Garmin instruction manual showed that the radio could easily be configured for the Canadian channels. 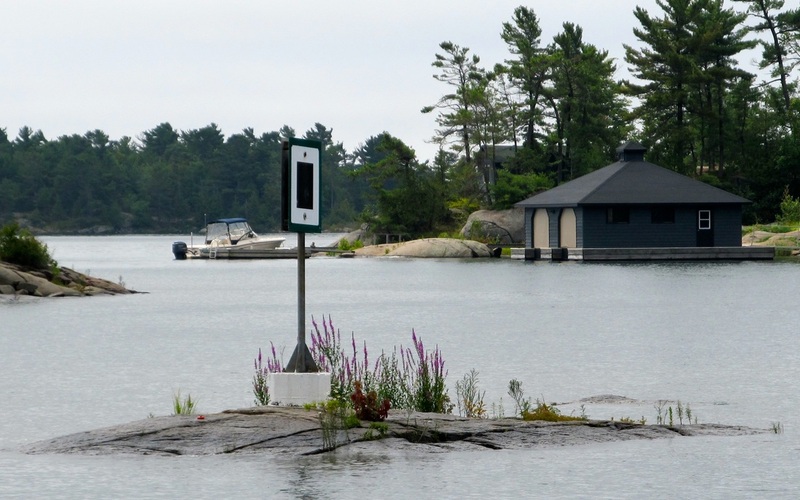 Canada does scrimp on its green floating buoys. The green buoys are so small that traveling at 8 MPH; they come into view when the tug is 3 or so minutes away from them. Traveling faster can cause bad things to happen in the narrow places. 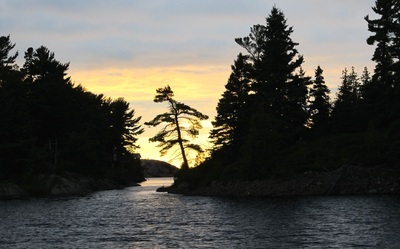 Our next destination was Bernadette Bay on Bernadette Island. A look-see found it uninteresting for 1 PM; Andiamo continued on to the next destination on 12 Mile Bay that was about 12 miles away. The small craft route took us to the outside edge of the islands. Dark rain clouds were approaching from the southeast but the wind was light to moderate with no white caps across the expanse of Georgian Bay. Andiamo was motored up to its fast cruising speed for about 30 minutes until the hard rain hit as we rounded O’Donnell Point. Cruising in the rain is quite easy and safe in the tug. 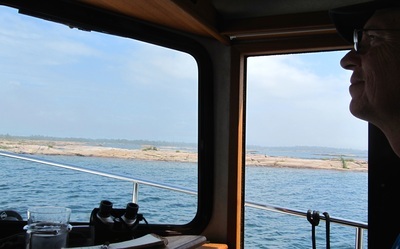 Andiamo had caught up with two cruising boats that continued northward as we turned off the small craft route onto 12 Mile Bay. Andiamo had travelled 36 miles in 4 hours. The morning was shrouded in fog with the air calm and the water was still. Andiamo had a thick coat of morning dew that collect a variety of insects that perished during the night. After breakfast, we read, relaxed and waited for the fog to lift. Laurie made and baked bread that made the whole tug smell delicious. At 11 AM the fog had lifted to a 100 feet above the water and we could see a ½ mile, which met my minimum standard. 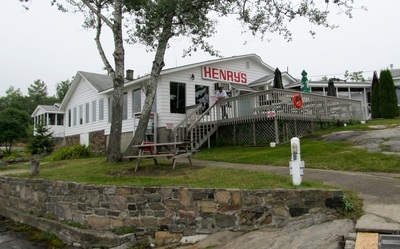 Andiamo’s anchor easily came up and the tug headed north up 12 Mile Bay toward Frying Pan Island and the destination of Henry’s Restaurant. Arriving at lunchtime with only two boats on the half dozen finger piers. 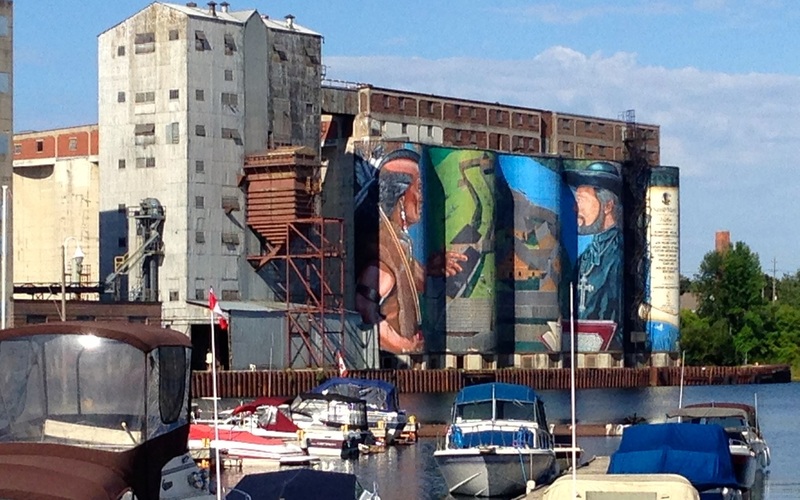 One was a Mainship 390 and we talked with the owners from Toronto and who had thought about doing the loop. They told us that Parry Sound was a nice little town and worth the trip. We had been ambivalent about this side trip because Andiamo was fully provisioned but were swayed by this conversation. 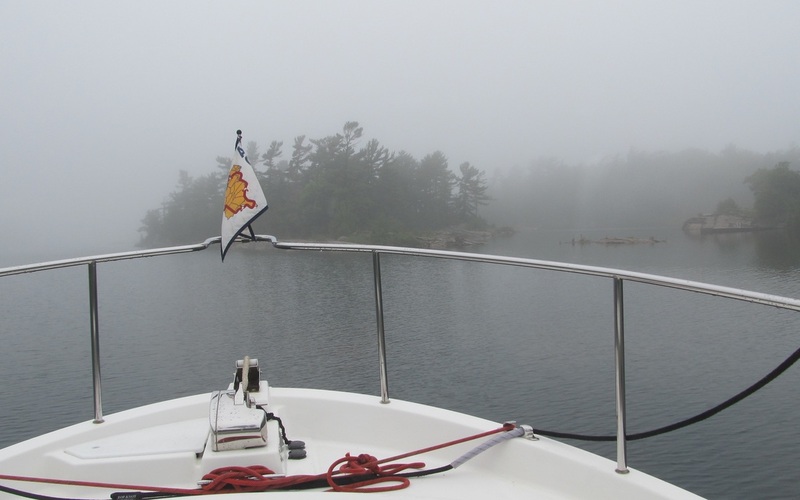 At 1PM the fog had not fully lifted from the islands north of Henry’s but we decided to head out in the ½ mile visibility. Sometimes, you have to take an acceptable chance and head into the fog to find clear sailing. In 30 minutes, Andiamo was under clear skies as we had finished going through a fog bank that was parked over Frying Pan Island. 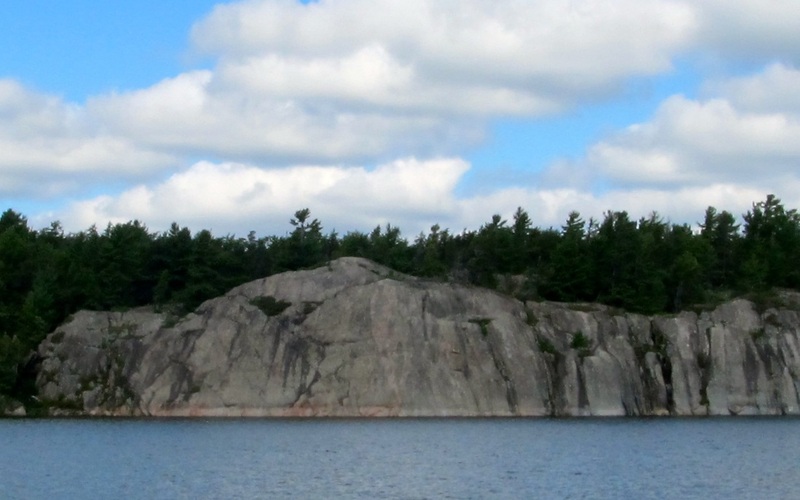 Laurie had plotted the course to Parry Sound by way of the scenic South Channel that goes through Devil’s Elbow, Seven Mile Narrows, Five Mile Narrows, Three Mile Gap and Two Mile Narrows. Andiamo went between more islands that could be counted. The boat traffic was steady with sailboats, workboats, cruising boats, and go-fast fishing boats. Andiamo arrived at the Big Sound Marina in the town of Parry Sound that is the hometown of Bobby Orr, the famous hockey player during the 1970’s. 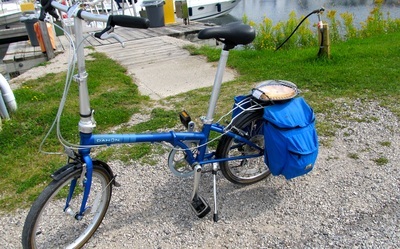 The town was explored on the folding bicycles and we enjoyed the exercise. Andiamo had traveled 23 miles in three hours. This would be an unintentional long travel day because Andiamo would take advantage of unexpected opportunities. 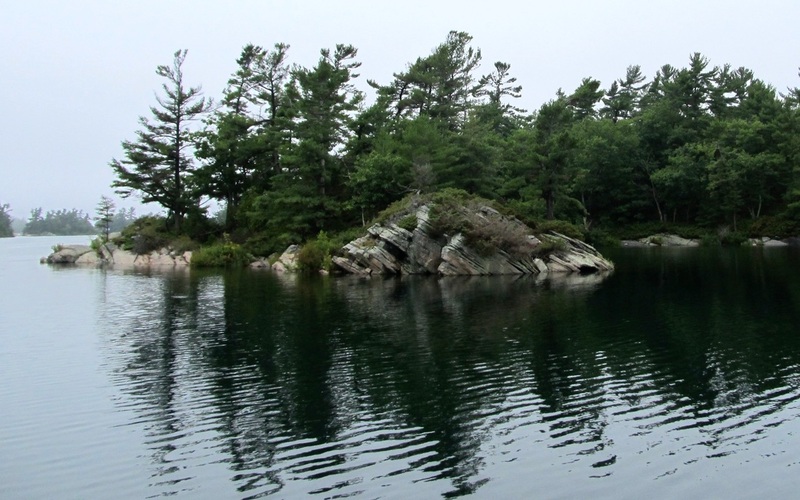 The morning was cloudy and cool with the cloud ceiling ranging from 100 to 200 feet above the water. This August weather is very similar to ones at British Columbia’s Vancouver Island. There would be other similarities that would be revealed as the miles clicked by. 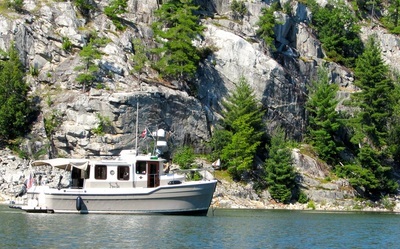 If you love the Georgian Bay, you will love the Pacific Northwest’s San Juan Islands, Gulf Islands, Barkley Sound, Desolation Sound and the Broughton Islands. Leaving the marina, Parry Sound was a mirror; flat, smooth and reflected the sky. 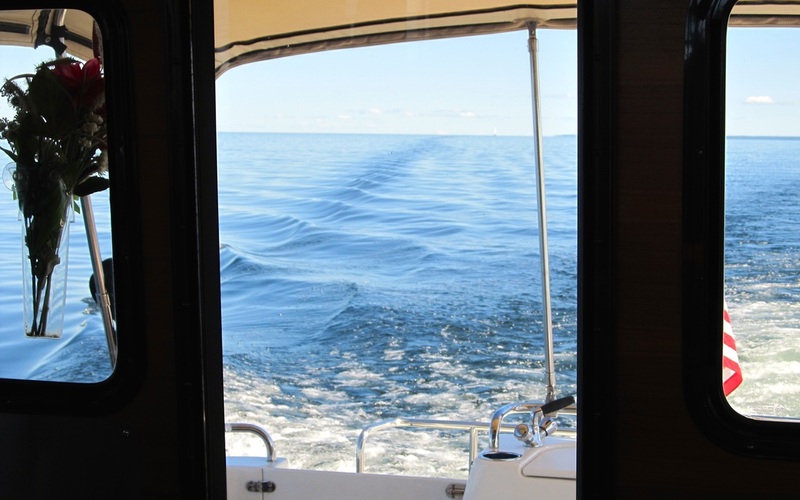 Andiamo’s Yanmar engine clicked over the 800-hour mark as the long, wide, and deep sound was crossed. 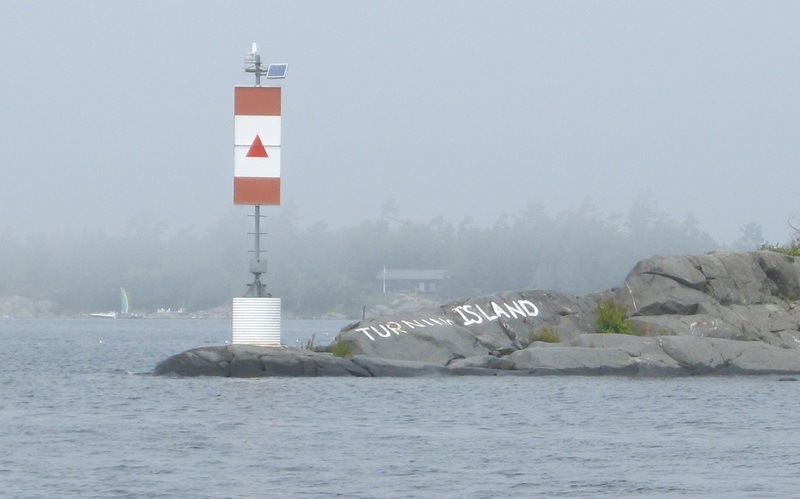 Continuing past the communities of Kilbear, Snug Harbor, and Dillon, the fog would rise and fall creating a range of visibility from over 5 miles to less than ¼ mile. Andiamo ran in thick fog, with visibility of 1/8 of a mile for about three miles that was safe because the water was deep, the channel was wide and the chartplotter and radar provided accurate locations of the tug and the surrounding land, rocks and buoys. 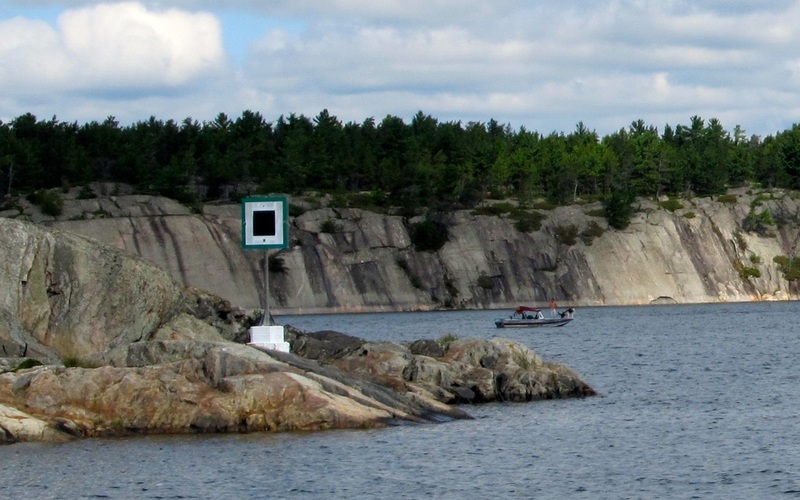 The tug followed the small craft route through Haggart Narrows to Pointe au Baril that loosely means a place where fisherman marked the safe passage with a light in a barrel. Following the channel toward the main body of the lake, the tug made a 180-degree turn between rocks and markers to catch the entrance to Hang Dog Narrows that is a continuation of the small craft route and is not recommended for boats less than 40 feet long or have a draft of 5 feet or more. 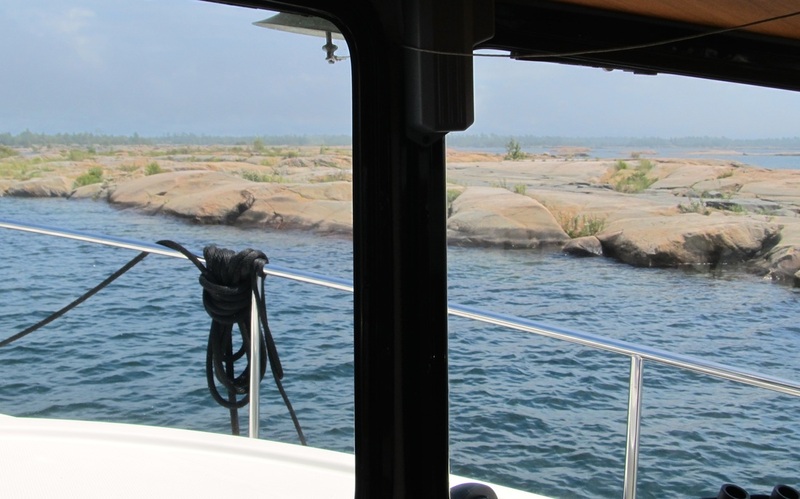 Andiamo navigated between dozens of granite boulders, through twisting and turning channels. 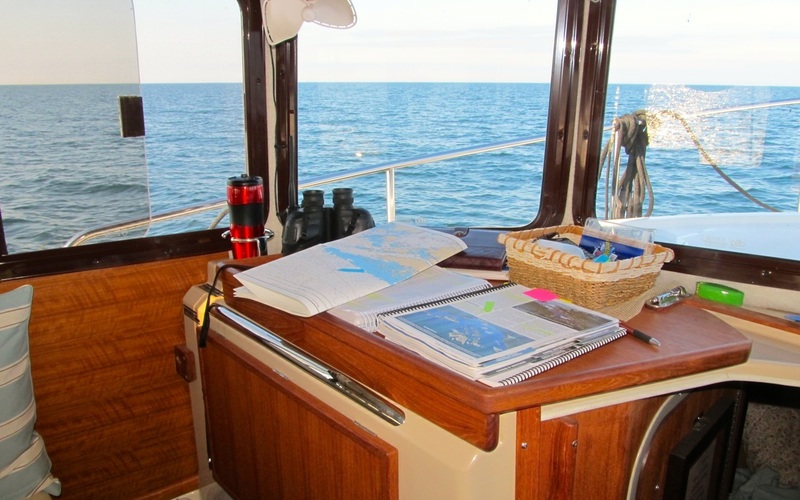 There was no time to study the chartplotter, as the steering was very active for 5 miles. 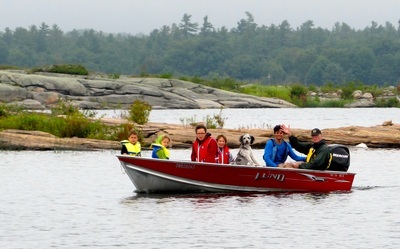 The Ranger 29 was perfect for this route and we felt safe and comfortable. It was suspected that very few loopers would use Hang Dog Narrows. Hang Dog Narrows ends at Alexander Passage that extends north into a many islands and bays and south into the main lake. Some of the bays are charted and others are not. Andiamo turned left and headed out toward the main lake, going by cottages and small islets. Ahead of us, a Nordic 37 came out of a small bay and also headed into the main lake. Our intended destination was Byng Inlet to find an anchorage and the small craft route was separated from the main lake by a thin row of visible rocks and partially submerged rocks that were marked wit red and green channel markers. 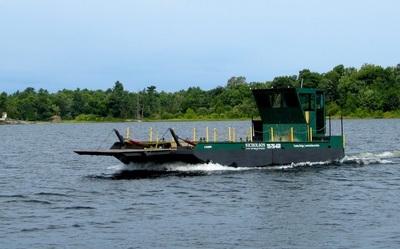 The Nordic 37 continued into the main lake and then later turned to the west while Andiamo followed the westward small craft route for three miles and accelerated to its fast cruising speed because the water was flat and smooth with a light wind pushing the tug along. The Nordic 37 had seen something that we saw later: a huge fog bank was lumbering onto the lake and swallowing the small craft route. We adapted by finding a safe route into the lake, skirted around the fog bank and continued westward under clear skies and 5-mile visibility. At 13 miles per hour, the tug covers a lot of water quickly and we were at the entrance to Byng Inlet in 55 minutes. We left the Nordic behind and never saw it again. 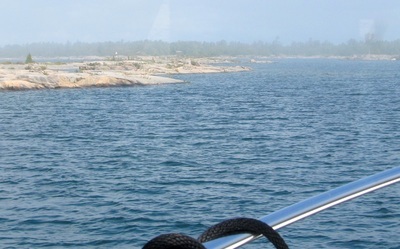 The afternoon was young, the anchorage in Byng Inlet was uncertain, the water was flat and calm, and the highly recommended Bustard Islands were only 15 miles away; Andiamo continued on. 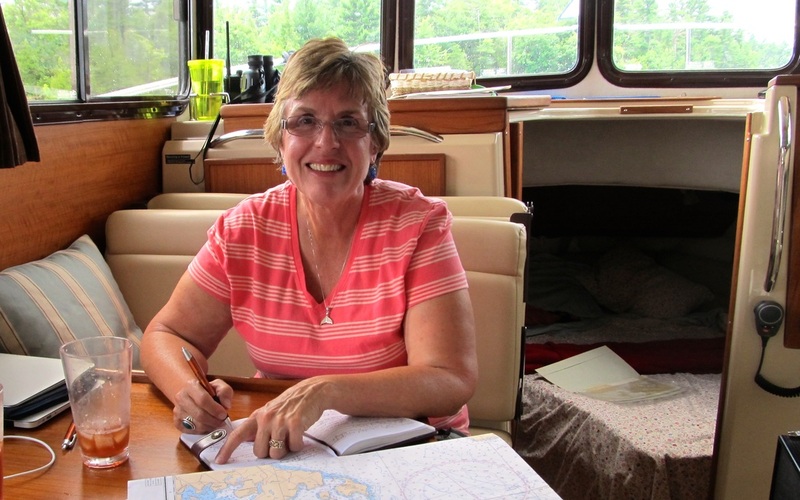 We used the paper charts and the chartplotter to locate a safe and marked passage from the body of Lake Huron through the clusters of rocks, past Dingy Rock to the marked small craft route that led to the Bustard Islands. If you love Sucia Island in the San Juan Islands of Washington State, you will love the Bustard Islands, as there are many protected anchorages in long fingers of bays. The Ultra Anchor was dropped and quickly set in 14 feet of water and at the head of bay that should have been very popular on a Friday in August but no one was here. Andiamo had motored for 8 hours and traveled 73 miles. Trip wise, Andiamo had traveled more than 3,200 miles. We were not tired as the cruising in the tug is simply easy. The wind was light from the west and as the sun went down, the wind veered to the east as predicted and remained light. Finally, we mastered understanding the Canadian VHF radio weather prediction broadcast that is delivered in a numeric code after a narrative of the synopsis. Bill and Marsha, in Midland, had given us a tablet of forms that they had created to decipher the code. When the code was delivered, Laurie filled in the boxes that led to the explanations for each number. It is a pretty cool system once it is understood. Like so many complex things, the threshold of understanding creates insiders who get it and outsiders who don’t. Now, we are insiders. The morning was cool with high clouds that only partly blocked the sun. The light wind was from the east and for this part of Georgian Bay; any wind direction that does not have “south” in it makes for a good travel day. Why? Wind from the southeast, south or southwest will travel across the 70-mile width of the bay and create uncomfortable, if not dangerous waves by the time they each the bay's northwest corner. The anchor slid up easily and Andiamo eased out of the protected harbor, turned to the west and rode the low chop with the wind at our backs. The tug did 18 miles of open water under idyllic conditions, going with God, and that felt like riding on the back of the wind angels. 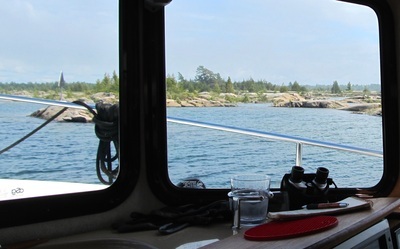 At Rooster Reef, Andiamo turned to the northeast to take the scenic route around Philip Edward Island before heading through Killarney Channel. 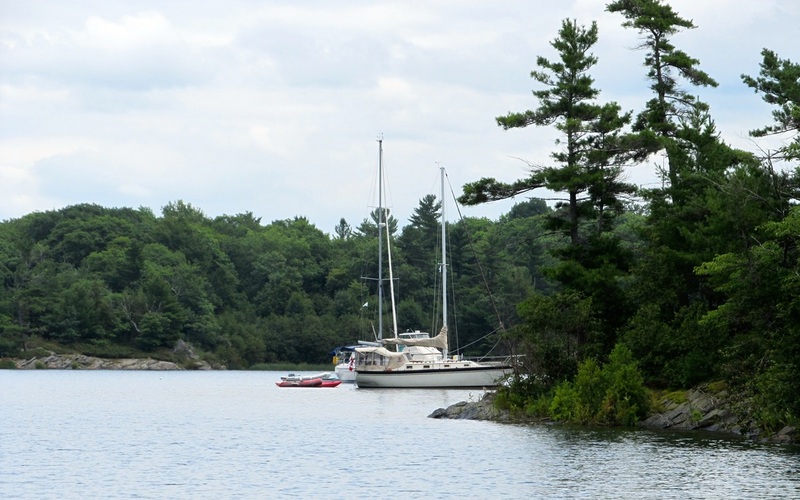 Most sailboats, cruisers over 40 feet and those with a draft of more than 5 feet do the direct route to Killarney, miss 10 miles and all of Beaverstone Bay and Collins Inlet. 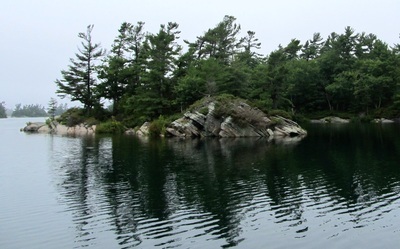 Beaverstone Bay was dotted with islands and necked down to a very narrow channel and shallow depths where it connected with Collins Inlet after a 90-degree turn. Collins Inlet was simply fabulous with high banks and granite bluffs that were covered with pines, firs and cedars. The Collins Inlet is home to very rustic hunt camps and very small marina operations. 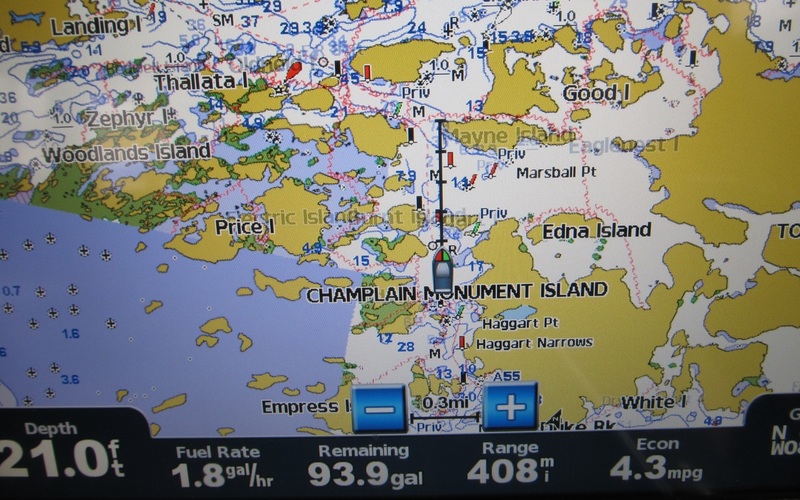 The last six miles is a very narrow channel with no channel markers because common sense says to stay in the middle. The trip was delightful and memorable. At 1130 we saw the first boat of the day. Three and a half hours of cruising on a pretty Saturday in August and we are alone. This is the story of not only this summer, but is also most of our experience on this trip. 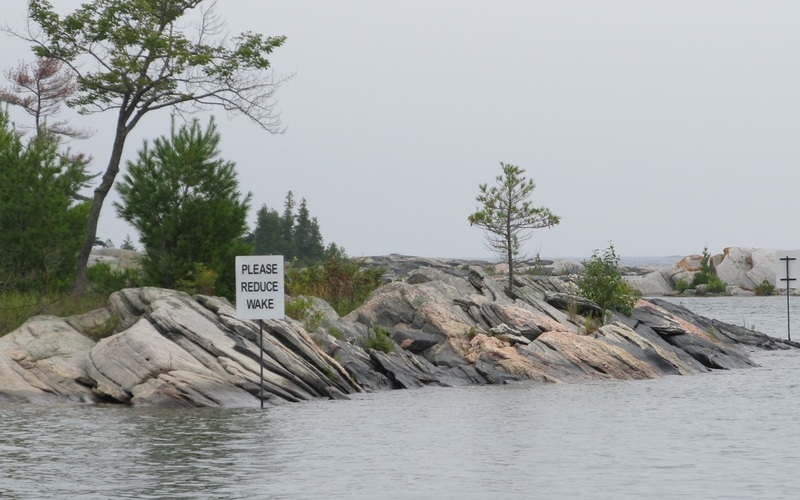 Simply, boaters are not coming out. Some say that is the price of fuel that keeps people off the water and others say it was the weather. 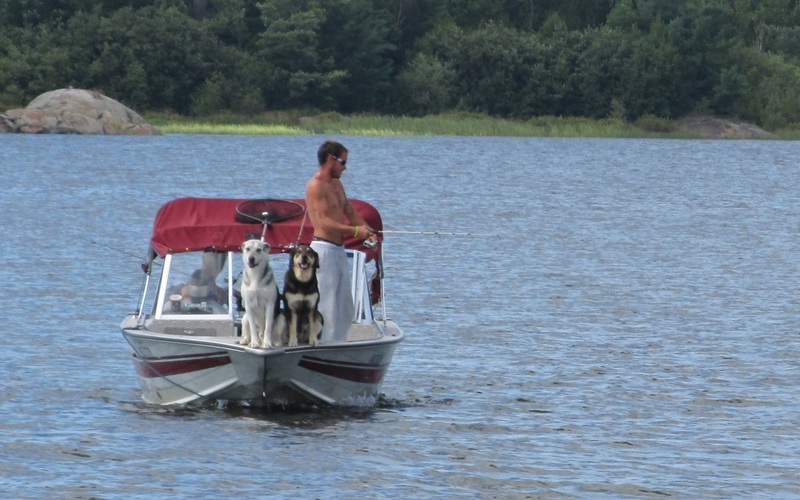 Regardless, it feels like the great recession has it grips on the boating industry. We left Collins Inlet and had another 5 miles of open water that was easy to do and entered Killarney Channel, past Entrance Rocks that signaled the end of the Georgian Bay and the start of the North Channel of this region of Lake Huron. 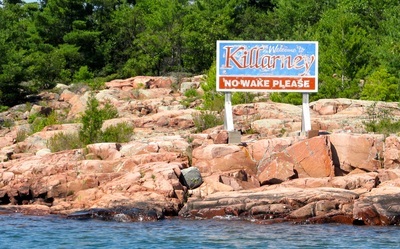 Killarney is a small town of 400 that depends on boaters and tourism to survive. We docked at the general store to buy ice cream, a couple of items and to walk the businesses on the shoreline. 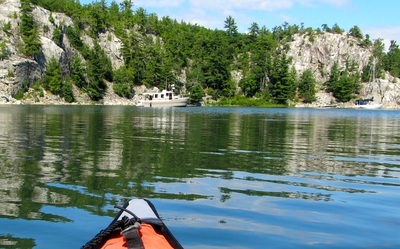 The first option for today’s destination was Covered Portage Cove that was about 30 minutes from Killarney. From the description in the cruising guides, we were prepared for many boats and would opt to move on if it was too crowded. 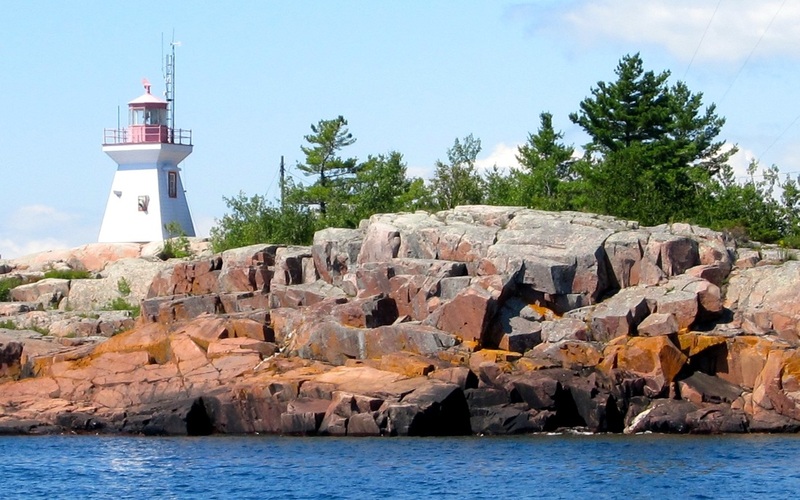 However, after passing the big-boy boats at the mouth of the cove, only one sailboat was in the cove. The anchor was dropped in 4 feet of water under the tug’s keel and it set soundly. 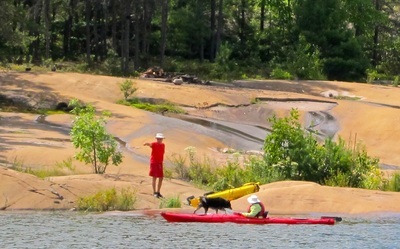 The kayaks were dropped from the roof and were used to explore the cove and examine a beaver lodge. By sunset, two other sailboats had arrived and the light breeze had faded away. Andiamo had travelled 48 miles in 6 hours. The next morning brought nearly clear skies and a light wind from the southeast. 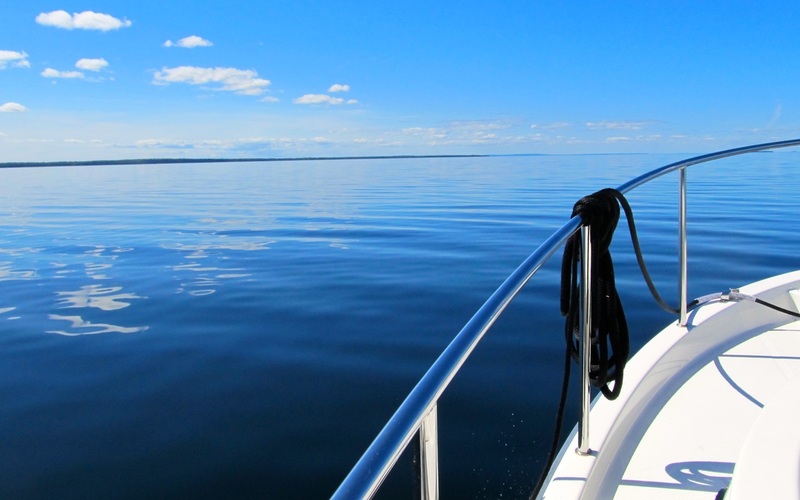 With the temperatures in the high 70’s, summer had come back to this part of Lake Huron. After breakfast and donning a wetsuit, hood, boots, gloves, fins and a mask, I dove Andiamo to replace the prop anode that had spun off. The corrosion protection system was still intact with the anodes on the trim tabs and the large “license plate” on the transom. This was just unfinished business. The solar panel controller had an alert light signaling an error code that revealed the failing of the ambient temperature sensor. A look at the sensor showed it was corroded and loose. The owner’s manual said the unit needed to be service. This fix will be addressed after returning to the states when there is a good Internet connection. Andiamo does need the solar panel on this trip. 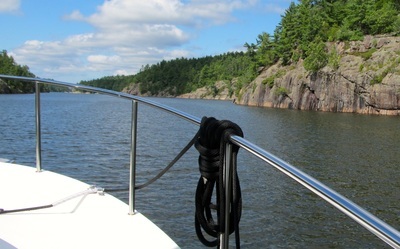 Mid-morning and the anchor was pulled with the destination only 26 miles away at Baie Fine. Jim Favors, a looper veteran and frequent cruiser of the North Channel whom we had met at a Ranger Tug rendezvous, recommended this anchorage. 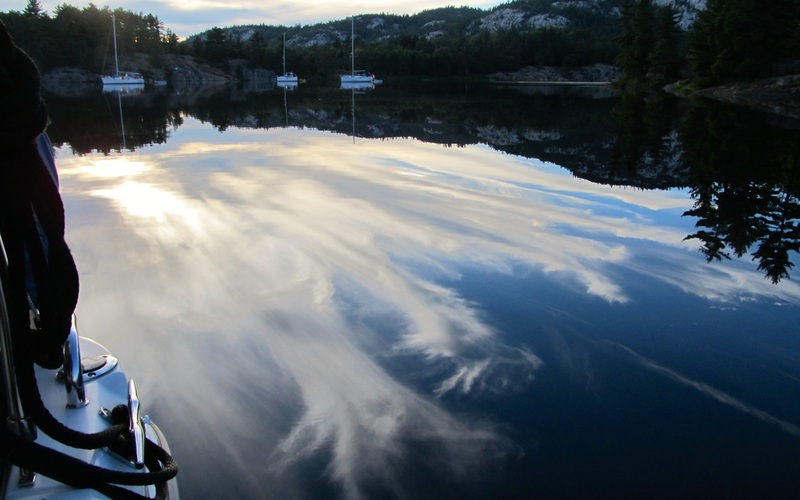 This is a long fjord-like waterway that has an enchanting anchorage at the end. Andiamo motored down Lansdowne Channel, turned at Peak Island and crossed Frazier Bay to enter 10 mile long Baie Fine whose entrance would be tricky for the bigger boats. Shortly thereafter, the channel markers were gone. 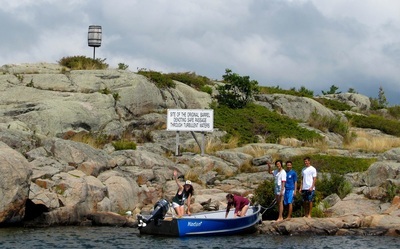 Probably, the channel marker people decided that if you can handle the entrance and were smart enough to see the rocks, that channel markers were not necessary. The boat traffic was minimal which was odd for a Sunday. 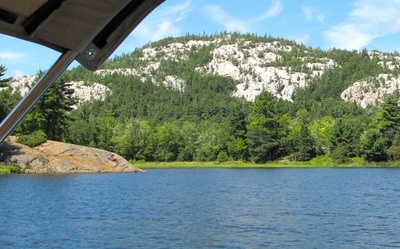 Andiamo picked a route through the islets to find the narrower channel that continues eastward, enters Killarney Provincial Park, and we left several large sailboats behind who elected to not attempt this channel. The entrance was uneventful for Andiamo and we continued to the end, known as “The Pool.” In 8 feet of water, the anchor was dropped and set easily sharing this remote anchorage with two sailboats from Chicago. The afternoon was lazy and slow. Reading, napping and chatting until a dinner of BBQ pork chops with broccoli. The setting sun created an amazing reflection of clouds on the very still water that was more of a canvas than a mode of travel. Sunrise is about at 0630 hours and when the sun crested over the low hill about 45 minutes later, the interior of Andiamo was spot lighted was the sun shined in the front windows. Though the windshield is covered with canvas at marinas, at anchorages like this one where there are no neighbors, the windshield remains uncovered. The morning brought heavy dew and billions of the smallest flying bugs that perished on the cabin or were caught in webs that were created in a few hours. The water was smooth and the wind was light, as Andiamo motored out with no else on the water. 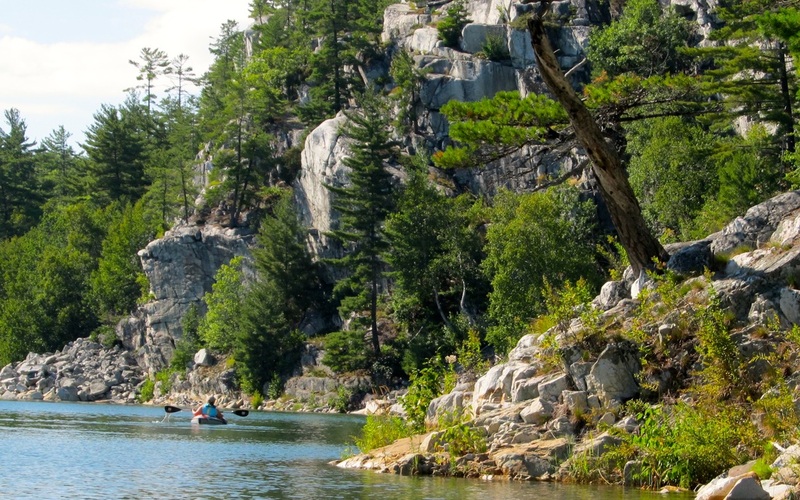 We glided past the serene scenes of trees in the morning light on the rocky and craggy slopes. 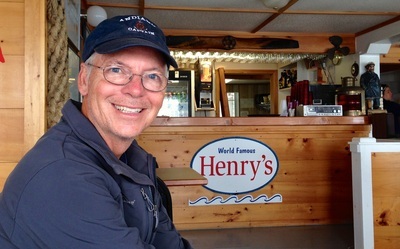 Out in Frazier Bay, the tug may be as far north in latitude, nearly the equivalent of Olympia, Washington. 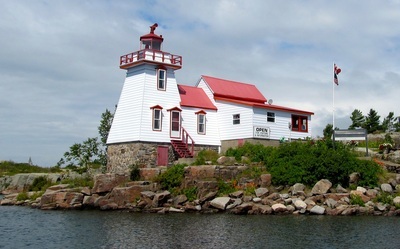 Andiamo turned at East May Island and went between Strawberry and Garden Islands to enter the channel to the town of Little Current. 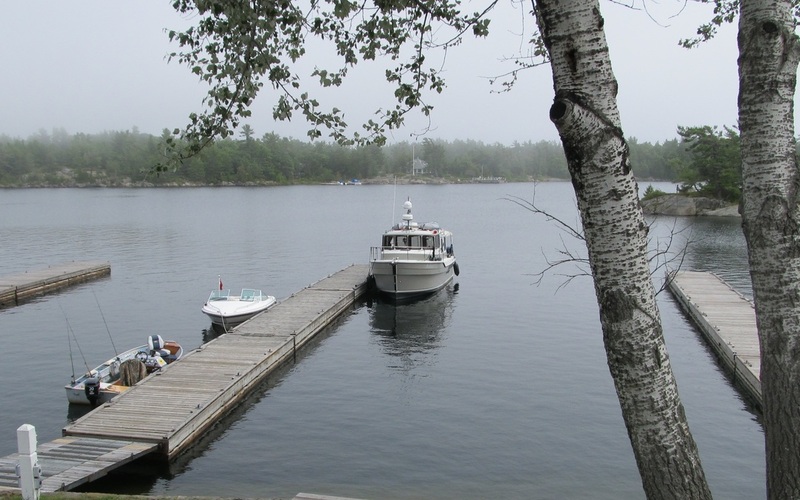 The massive swing bridge that connects two islands at the town’s border was opened for its hourly passage of the boats over 18 feet and it closed before Andiamo arrived but we glided under it with our 13 feet clearance because Laurie had lowered the VHF antennae. 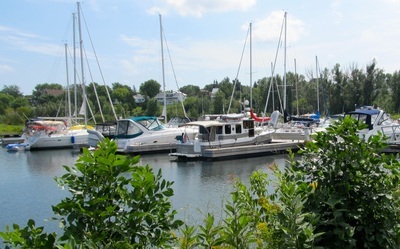 Five minutes later, Andiamo arrived at Spider Bay Marina and we were secured in a 30-foot slip in the early afternoon. Andiamo had traveled 26 miles in 3 hours. It was time to re-set the tug for the next passage. The water tank was filled, diesel and a pump-out would happen the day we left, laundry was done, and the bikes were set up for the ride to the grocery store. The one-mile ride to this town of 1,700 was easy and nearly level. The nearby town docks were about half full. 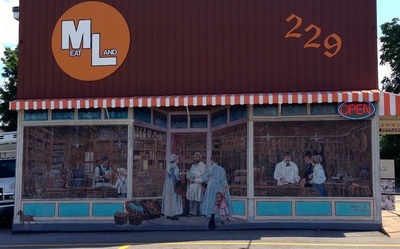 We had tonight’s dessert first with a stop at an ice cream store that catered to the locals. 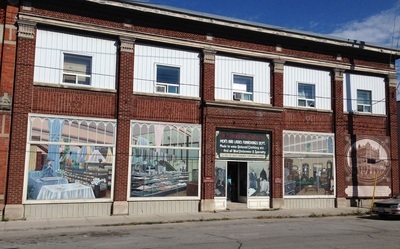 The small grocery store was easy to navigate and after all the packaging was removed, the purchased items fit into the two bike bags and a backpack. 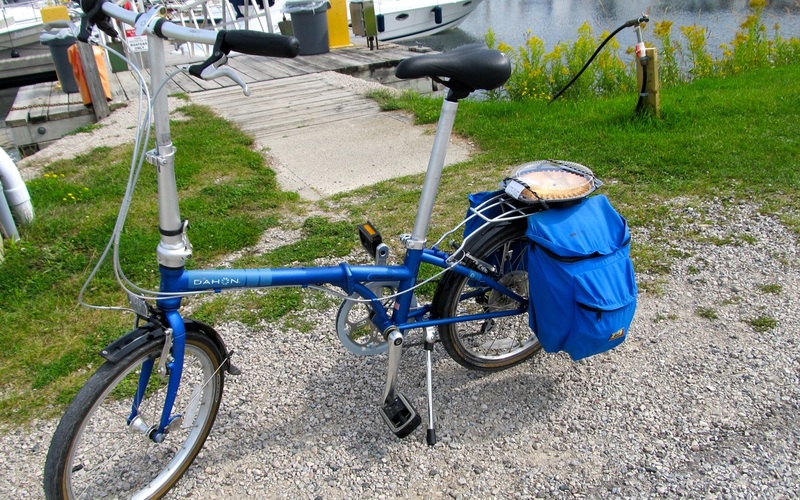 Even the strawberry-rubrub pie was secured on the bike rack. After dinner, we had a planning session after looking at the different weather predictions and determining what the travel windows were. On this part of the Great Lakes, the westward winds cause the most problems in the forecast. Double-digit winds can create huge waves that will keep the powerboats in harbor. We may have to adjust our hopes to see more islands to take advantage of a travel window. Faith in the weather forecast can be challenging. The morning’s winds were moderate, just barely double digits, and from the west. In Puget Sound or on any of the protected waters of this trip, we would have left. 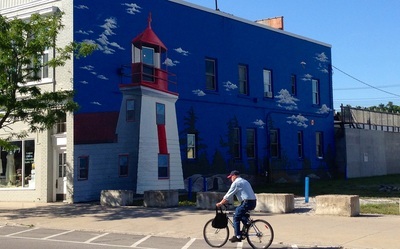 But Environment Canada had forecasted westerly winds in the mid-teens by noon and in the mid-20’s by mid-afternoon. The next part of the trip, Andiamo would be heading west for nearly 100 miles. In thirty years of boating, we have made the mistake of going into double-digit winds on large bodies of water and suffered through 3 to 5 foot waves for hours. We are old enough to have learned from experience, but not so old that those lessons are forgotten. We stayed in the marina and watched the wind rise over time. Routine boat projects were accomplished with the cleaning of the shower sump pump, a check of the holding tank, cleaning shelves, scrubbing places that had been forgotten and waxing the track of the sliding door that made it so easy to move. With access to the Internet, lots of communication, research and updates were accomplished. The CBS Evening News was even streamed, a broadcast that had not been seen for several weeks. 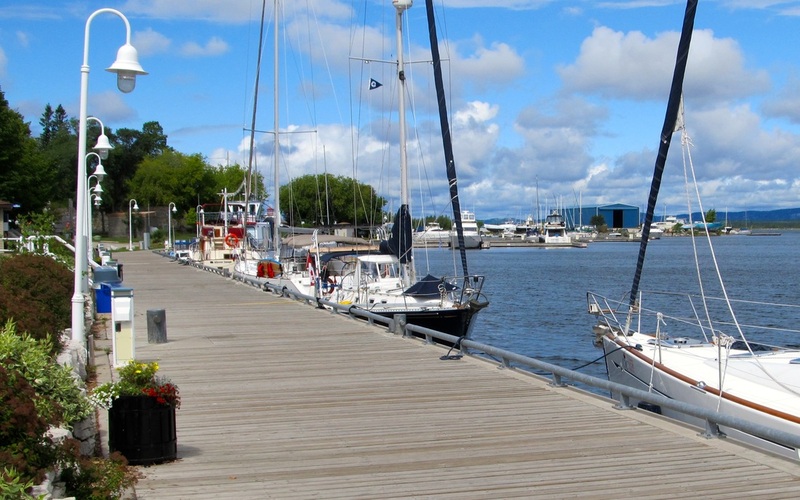 After lunch, we walked into Little Current and browsed the boats at the town docks and walked the main street. 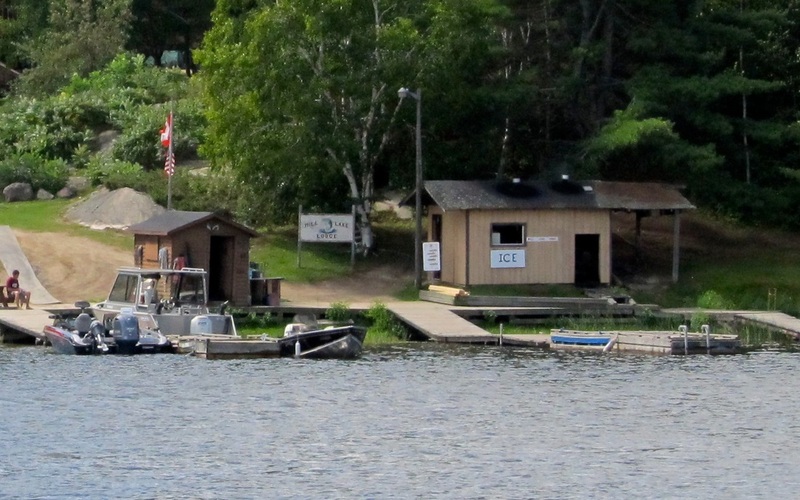 An ice cream store on the docks was closed with the sign, “Closed For The Season.” This was our first indication that the boating season was ending here and caused thoughts of the need to head south in the coming weeks. The afternoon was closed with reading, strolling and watching the 30-mile per hour wind gusts roll push the boats around. 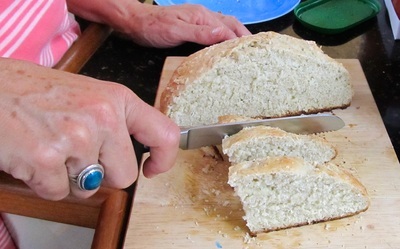 Laurie made a meat loaf in the oven and served with new potatoes and wine and pie was enjoyed during a movie. Wednesday morning was cool and jackets were worn and the forecast is for cooler temperatures. After breakfast, the Little Current Cruiser’s Net was monitored on VHF radio channel 71. Roy broadcasts this every morning in July and August from The Anchor Inn. The format is a narrative of the weather forecasts, the headlines of the day, and then a roll call of boaters that are listening. Today’s count was 44 boats. Andiamo was moved over to the fuel dock for diesel and a pump-out in preparation for a possible early morning departure tomorrow. The marina employee said that about 40 to 50 looper boats had come through this season. The tug had traveled 232 miles since Midland, burning 2 gallons per hour and getting 3.86 miles per gallon. Diesel was $5.52 a gallon. It was jacket weather all day. 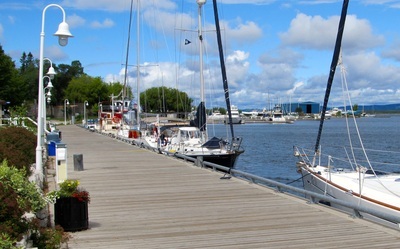 We walked into town to send postcards, have ice cream and watch the coming and goings on the town dock that was the exact opposite of the quiet of Spider Bay Marina where the young employees were bored. A slow afternoon was spent looking at data, reading blogs and being impulsive on the Internet. We had been without this drug of instant information at our fingertips and we could not get enough of it. 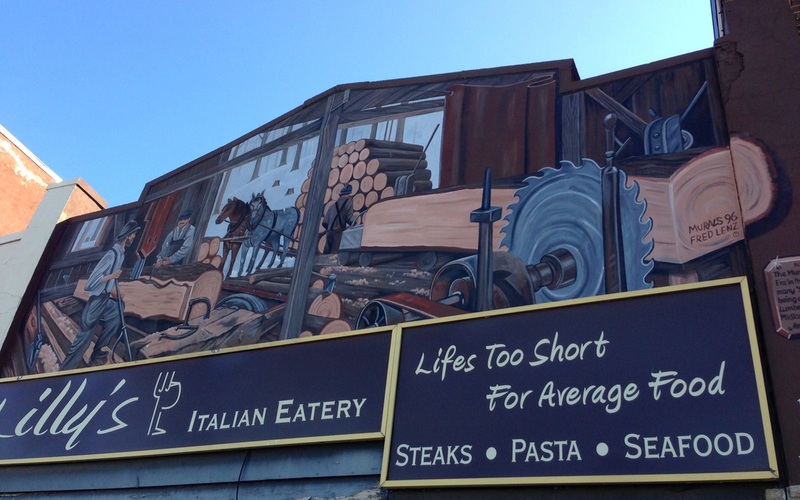 Another walk into town to have dinner at the Anchor Inn and Laurie’s Fitbit recorded 10,000 steps for the day. The wind was just under the label of howling. Being bundled up, it was hard to imagine that the wind should be flat tomorrow or that central Illinois, perhaps two weeks away on the trip, was in the 90’s. 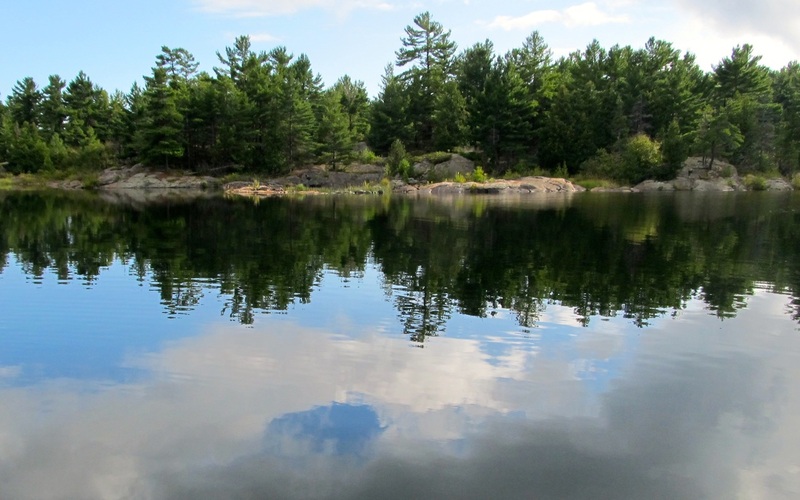 The weather angels gave us a gift with a day of clear skies, light winds and flat water. We pulled away at 0700 hours from Little Current and headed west. 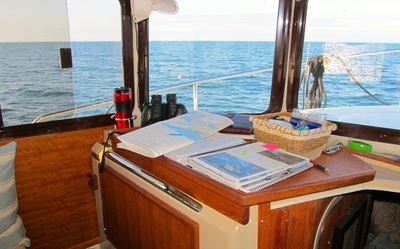 After the one mile of channel markers, the open water unfolded before us and the auto-navigation with the auto-pilot was used as Andiamo crossed the 8 miles at 13 MPH, then slowing to navigate the markers at Clapperton Channel. With a 1 to 2 foot chop coming from the west, the tug ran for another hour at its high cruising speed, passing Gore Bay and slowing at Cape Roberts. Andiamo found a comfortable yet relatively fuel-efficient speed for this chop at 2150 RPM’s and 8.8 MPH using 3 gallons per hour. The tug was slightly quartering the chop and going just fast enough to plow through them without bouncing thus making a comfortable and sustainable ride. 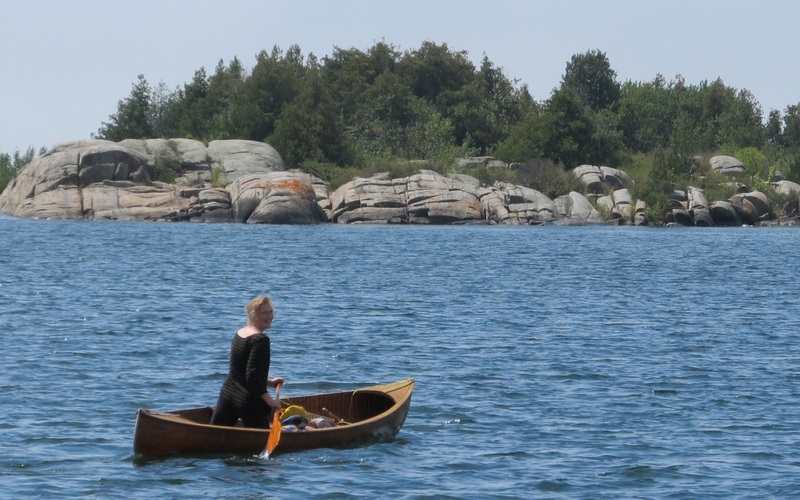 By mid-day, 50 miles were behind us and Environment Canada forecasted that the winds would lighten that would flatten out the water. 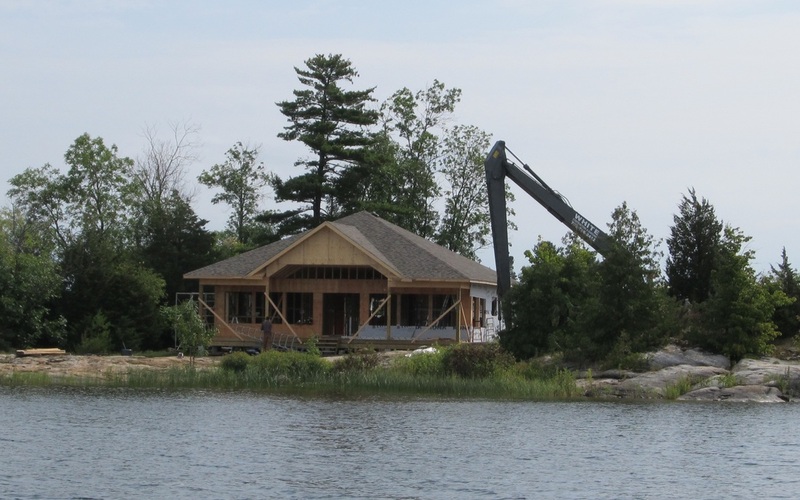 We elected to continue past the planned destination Meldrum Bay and go the longer distance to Drummond Island. The auto-navigation and autopilot ran Andiamo for hours through this open water as we chatted, speculated, reviewed and enjoyed the ride. Andiamo returned to the United States and the State of Michigan at Drummond Island near Sulphur Island. 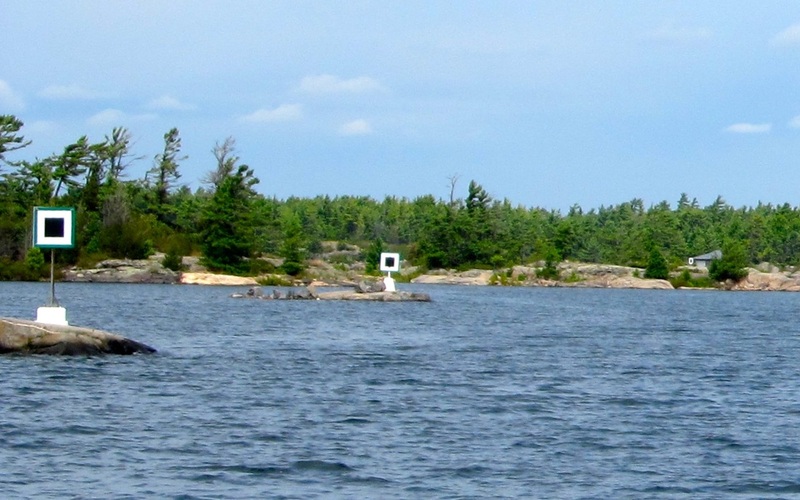 Turning around Chippewa Point, we followed the wandering channel markers to avoid shoals and to go around small islands to enter the small marina at Drummond Island Yacht Haven. The two customs officers work until 6PM and we arrived with enough time that we would be their last check-ins. 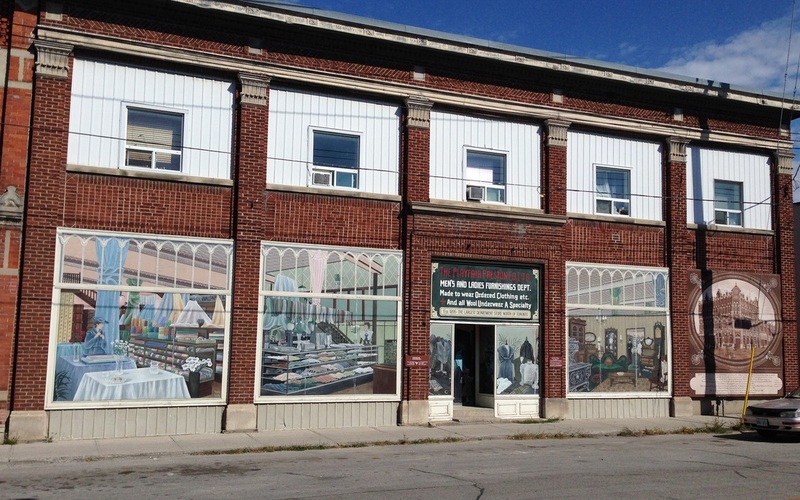 The check-in process was brief and professional and they took the Canadian tomatoes and peppers. Andiamo had traveled 97 miles in 10 ½ hours that is a new personal record. The forecast was several days of wind and rain and we were glad to take advantage of this traveling opportunity. After a light dinner of soup and tortillas with cheese and spices, we strolled the marina and then watched a movie as the sun went down. Do these channel markers take us right to the shore? Yes, it is an aqua-lawnmower cutting the vegetation that grows from the bottom. 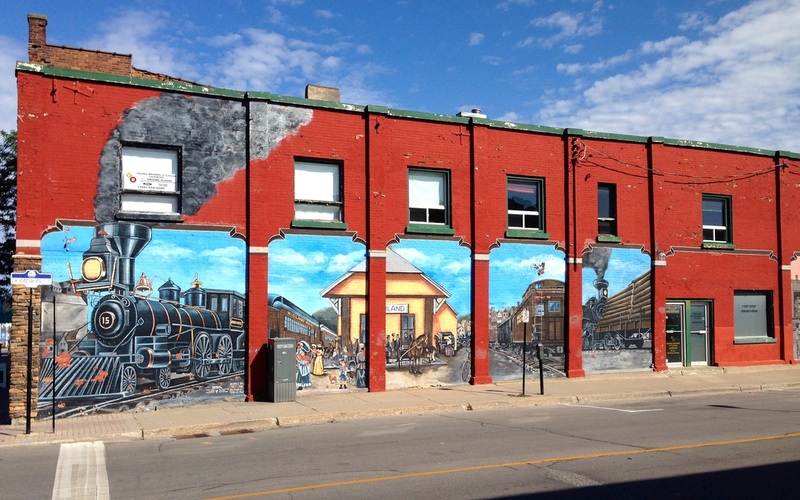 An exercise opportunity in downtown Midland? Huh? This sport is a big deal in Canada. Like shuffleboard on ice only more complex. What is it? Art of course and it atop the nicest looking "Water Treatment" plant ever. 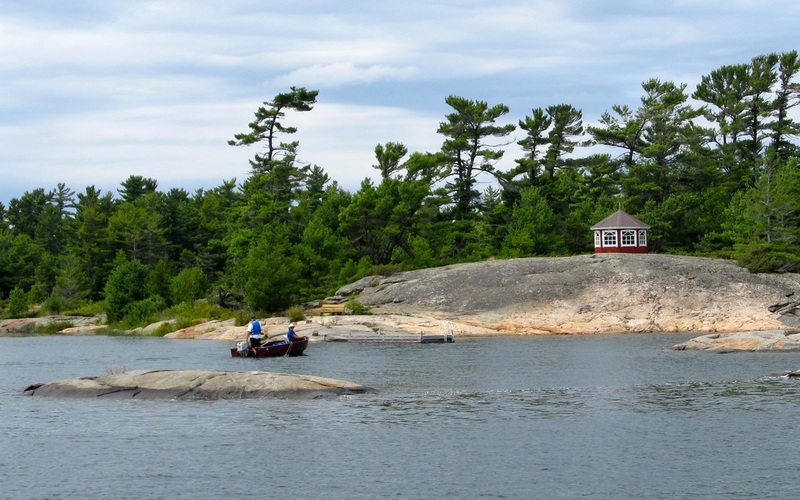 In a wilderness area that has rustic cottages, you round the corner and see this. A private marker with an attitude. An inspiration for all marinas.